A welcome ceremony for Vietnamese President Tran Dai Quang was solemnly held under a chair of Belarusian President Alexander Lukashenko at Independence Palace, Minsk capital of Belarus yesterday. After the ceremony, the two leaders and high- ranking delegations of the countries had a talk. Vietnamese President Tran Dai Quang and Belarusian President Alexander Lukashenko received press agencies to announce about result of the talk. 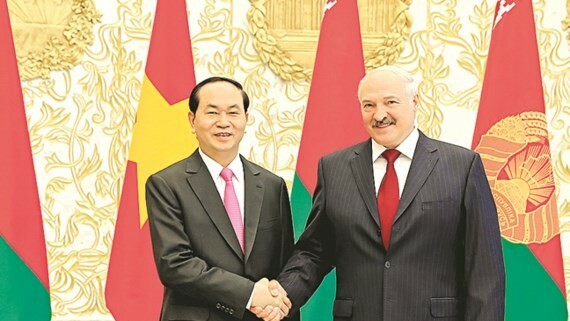 On the spirit of friendship between the two nations, Belarus always considers Vietnam as a long- term cooperative partner; the nations had common awareness for cementing the bilateral cooperation. President Alexander Lukashenko appreciated that the two- way economic and commercial cooperation achieved good results, in particular, Vietnam- Eurasian Economic Union (EAEU) Free Trade Agreement is considered as a foundation to create new development, contributing to increase the two- way trade turnover. The leaders agreed to increase the two- way trade turnover up to US$ 500 million. 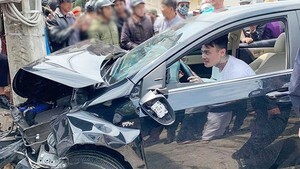 Both sides will expand export of Vietnamese cargoes to Belarus as agricultural products, machines and automobile; and supply Belarusian agricultural tractors to Vietnam. 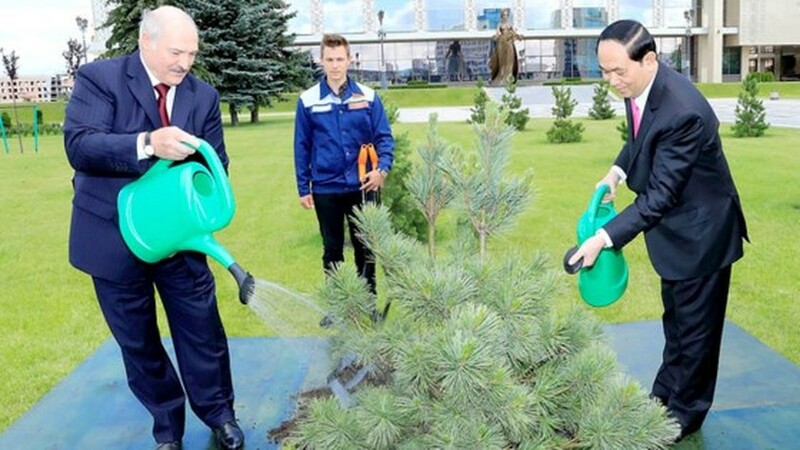 Vietnamese President Tran Dai Quang and Belarusian President Alexander Lukashenko participate in a tree-planting ceremony at Independence Palace. President Quang, on behalf of Vietnamese leaders and people, expressed desires and determine in consolidating and strengthening traditional friendly ties with Belarus, meeting general benefits. The leaders highly appreciated mutual good political relationship and belief, which have been developed within past 25 years since Vietnam- Belarus officially established diplomatic ties in 1992. After the discussion, the Vietnamese and Belarusian leaders co- signed a common statement on comprehensive and deep partnership development between the two nations. They witnessed a signing ceremony for nine cooperation instruments. On the same day, the Vietnamese President met Belarusian Prime Minister Andrei Kobyakov and the Chairman of the House of Representatives of the National Assembly of Belarus Vladimir Andreichenko. They laid a wreath at Victory Square. The leaders focused on solutions to strengthen bilateral trade exchange and balance, and expand investment cooperation between Vietnam and Belarus in the upcoming years. Both countries affirmed important role of Vietnam- Eurasian Economic Union (EAEU) Free Trade Agreement, active implementation of the agreement to create breakthrough in bilateral economic and commercial cooperation to increase two- way trade turnover up to US$ 500 million. Vietnam and Belarus agreed to continue collaborating and doing mutual cooperation program in the fields of economy, science, education and culture for the period of 2016- 2018; promoting effectiveness for activities of Intergovernmental Committee; actively supporting export- import activities and trade & investment promotion between the two countries; expanding industrial cooperation, especially to early put the joint- venture automobile assembly and production being established on the basis of the Protocol on supporting the production of Vietnamese motorized transport vehicle, into the operation.